Requested by Cody, this week’s retro spotlight falls on Super Mario Kart. Released on Super Nintendo back on September 1, 1992 the Mario Kart franchise has gone on to see massive acclaim and success. Just how well does this retro kart racer stand up to today? Mario joins his friends and enemies in a kart race all over Dinosaur Land. Super Mario Kart is about as accessible as a game can get. Turn on the game, press B, choose one of the four available game modes, choose from 8 available characters, and play. Controls are simple and precise: B controls your acceleration a uses the item you currently have, R and L allow you to do bunny hops and power slides. While power slides are super useful they do take a fair amount of work to master before you stop running into the very walls you meant to slide past. Playable characters include Mario, Luigi, Peach, Toad, Bowser, Yoshi, Donkey Kong Jr, and Koopa Troopa. Game modes included in Super Mario Kart are Mario Kart GP, Time Trial, Match Race and Battle Mode. Mario Kart GP is your main game type featuring two difficulties to start with, 50cc and 100cc, and an unlockable third, 150cc. 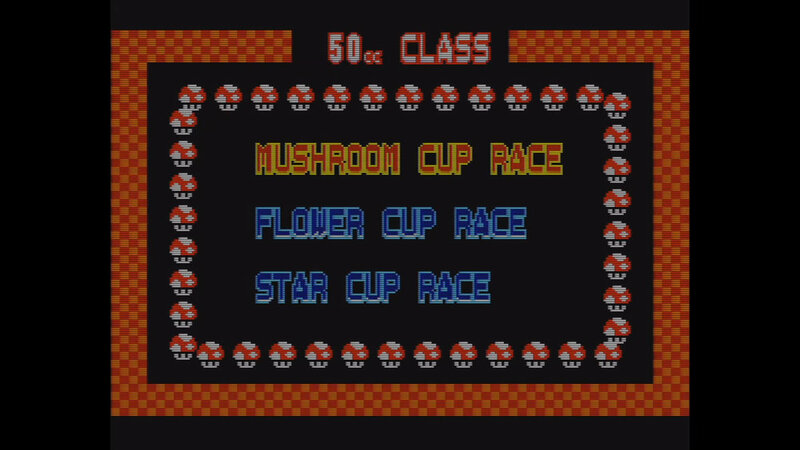 There are three selectable cups to choose from at the start of the game: Mushroom, Flower and Star cups. While only these three cups are available in 50cc, 100cc and 150cc feature an added cup that can be unlocked called Special cup. Each cup features five tracks, 20 tracks in total, from locations around Super Mario Worlds Dinosaur Land, so expect to see the Donut Plains, Choco Island and even the inside of Bowsers Castle. Each race consists of five laps which test player’s skill to take home the gold. To help in this goal, each track has item blocks you can drive over that will give you a random item. Items given are based on your current race position. Being in the bottom 4 positions will give you a greater chance for Star (an invincibility speed up attack item) and Lightning (shrinks all opponents) power ups, as well as red and green shells (projectile attack items). As you climb higher in positions you start to get less powerful items and are usually getting Coins (increases max speed), Mushrooms (a temporary speed boost), and Bananas (a placed attack item) with each box. If you want a break from Mario Kart GP, you can test your skills and see how fast of a time you can get on each of the game’s tracks in Time Trial. Time Trial features no items so relying on bunny hops to shave seconds off your time is essential. While Mario Kart GP can be played with 2 players optionally, Match Race and Battle Mode must have 2 players. Match Race lets you take on your friends in a one on one race on any of the game’s featured tracks, items included. Battle Mode is the main attraction for multiplayer outside of Mario Kart GP. Battle Mode pits players against one another in a test of skill, battling to be first to hit the other three times. Battle Mode features four unique maps separate from the normal race tracks. While only allowing two players is a letdown in today’s multiplayer age it doesn’t stop the battles from being hectic. If you are familiar with the Mario Kart franchise they have the nick name of being the “friendship killer”, and Super Mario Kart is no exception. There is always that one friend who would hop into a safe area in the Koopa Beach battle map and shoot shells out at you. Super Mario Kart has an amazing 16-bit soundtrack! Music is powered by a special add on chip called DSP-1 which really helped it stand out. Sound effects are varied and sound crisp, karts have different engine sounds based on the weight class of the drivers and, unlike later entries in the Mario Kart franchise, you know when one of your items takes out an enemy because of the sound that plays. I can’t even describe that sound you just have to hear it. Super Mario Kart utilizes Mode 7 graphics to bring its world to life. Mode 7 is a graphics mode on the Super Nintendo that could give games the illusion of being three dimensional. While many games utilized the feature throughout the life of the Super Nintendo, I feel Super Mario Kart has the cleanest and sharpest implementation. 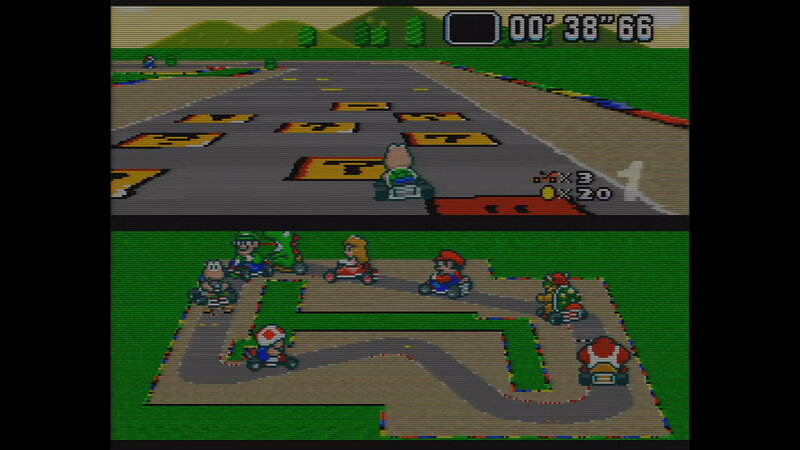 Super Mario Kart uses a split screen function during gameplay, even when playing single player. The top of your screen has your chosen racer, position, lap number, and items, while the bottom part of your screen shows a map of the track with the positions of each racer on the course or it can be toggled into a rear-view mirror to better set items against other racers. If you are playing with two players, the bottom screen functions as the second racers play screen. Sprites are well defined with each character getting a unique sprite for every angle you see them from. Tracks look clean and you feel like you can feel the ground moving under your kart. Super Mario Kart is a retro masterpiece. It has spawned numerous sequels and clones from competitors trying to copy its success. It even inspired Nintendo to try copying the formula into other spin-off franchises. If you haven’t had an opportunity to experience this retro classic, do it today! TL;DR: Its amazing go play it! Alright, I convinced you, huh? How can you play this game?! Super Mario Kart first released on Super Nintendo but has been released on other platforms using the virtual console service. SNES (~$35) – The original release. GBA (~$10) – While not a true version of Super Mario Kart, Mario Kart Super Circuit featured all the original tracks from Super Mario Kart as an unlockable bonus. Wii ($8) – An emulated port of the SNES version. Wii U ($8) - An emulated port of the SNES version. New 3DS ($8) - An emulated port of the SNES version. Anyone else torture themselves by playing with shrunk drivers? Leave a comment below!